By one of the most common definition of “emerging markets,” U.S. markets – in an economy that by many measures is one of the most developed in the world – may soon start to take on emerging market characteristics found in countries like India, Brazil, Russia and Indonesia. And that could be very bad news for U.S. markets. Political risk expert (and a former boss of mine) Ian Bremmer defines emerging markets as “those countries where politics matters at least as much as economics for market outcomes”. This suggests that the usual suspects that investors look at for signs of market trajectory – economic growth, inflation, interest rates, for starters – are downgraded to only be as important as politics. And in some cases, individual leaders can change institutions, further swaying markets. Of course, politics always has an impact on markets. Changes in regulation and significant government policy directed at a particular sector, for example, can affect investors in both developed and emerging markets. But it’s a matter of degree: Where do investors get most of their cues about future market trends? It used to be that in developed markets (like the U.S., Europe, and Japan), things were comfortable and easy, and there weren’t many surprises. Politics didn’t matter much to share prices. Economic growth was slow and steady, while stock returns were unspectacular but predictable. And then there were crazy emerging markets (like most of Latin America, Africa, and much of Asia), the wild west of investing, where anything could happen. Emerging markets grew faster than their developed counterparts, but they were also a lot more volatile. And bad politics – a cataclysmic political corruption scandal (Brazil not long ago), a dictator who invades a neighbour on a whim (Russia in 2008), regulators in bed with the sectors they were supposed to be looking over (much of Asia in the 1990s) – could erase years of market gains in a matter of days. Politics mattered in emerging markets a lot more than they mattered in more developed markets. With U.S. President-elect Donald Trump, politics – and the personal whims of the president-elect himself – are already assuming centre stage. When Trump comments on a company or sector – whether it’s pharmaceuticals, General Motors, Ford and Fiat Chrysler – share prices can rise or fall sharply. For example, shares of Japanese automaker Toyota recently fell 1.7 percent after Trump tweeted that he would force the company to pay a “border tax” if they opened a plant in Mexico. In December, Trump was critical of Lockheed Martin for spending too much money developing the F-35 aircraft. Subsequently, the stock fell 4 percent. Trump’s tweets have become daily market-moving events. And each Trump tweet triggers thousands of social media filters set up by high frequency trading hedge funds that look to profit from short-term volatility. This causes additional ripples throughout markets. Historically, since emerging markets were a lot less predictable than developed markets, they were viewed as a lot riskier. So for years, they’ve traded at a lower valuation (like the price-to-earnings ratio) than developed markets. Today, developed markets trade at an average price-to-earnings ratio of 22, compared to a P/E of 16 for emerging markets. The S&P 500 trades at a P/E of 21. The graph above shows the discount of emerging markets relative to developed markets. If the U.S. begins to behave more like an emerging market, and investors start to treat it more like an emerging market, the valuation of the S&P 500 – currently 34 percent higher than emerging markets – has a long way to fall. Valuations fall when earnings rise (the E of the P/E ratio), or the price (P) falls. What’s alarming is that the U.S. isn’t the only developed market that looks like it’s on a downward spiral towards emerging market status. The string of crises in the Eurozone in recent years meant that EU policies and politics, the bailout of Greece being one example, set the tone in financial markets for months on end. Brexit, rather than earnings or management or inflation or economic policy, guides much of what happens in British markets. Politics – especially in the form of a powerful, whimsical individual – driving so much of market activity is a recipe for uncertainty. Markets don’t like that kind of uncertainty. Political risk is a big reason for the valuation gap between developed and emerging markets. A main reason that a lot of people invest in emerging markets is that they think that over time, the valuation levels (like the P/E) of some emerging markets will rise. As share prices rise, the discount to developed markets would close. But the opposite could happen: The valuations of developed markets could fall, and close the gap with emerging markets by dropping down to them. Or that discount could remain the same, as valuations of both emerging and developed markets fall – as political risk across all markets rise. And if both valuations drop, history shows us that for every step “developed” markets fall, “emerging” ones fall faster and harder. If politics continue to play a greater role markets we may see lower stock prices – in the U.S. and markets elsewhere. I think that the end of the Trump rally will play a bigger role in the short term. But in time, investors may get tired of U.S. presidential volatility, and choose instead to stay away. This is because Singapore’s economy relies on trade like few other nations on earth. This is shown by the total trade as a percentage of GDP number – the higher the number, the more open a country is to international trade… and the more important trade is to that country’s economy. Trade through Singapore accounted for 326% of the country’s GDP in 2015 – the third-highest ratio in the world, after Hong Kong and Luxembourg. In fact, that figure has been at 300% or higher for Singapore since 1976, according to data from the World Bank (except for 1986 when it was 295%). With that in mind, here are three ways Singapore could be “trumped” by the new American president. Less attention from the U.S. The U.S. is Singapore’s fourth-largest trading partner as measured by total trade (imports plus exports). Trade between the two countries is dominated by the exchange of different kinds of machinery and commercial services. The chances are good that as President Trump focuses more on domestic matters, and on alienating China, the U.S. government will pay less attention to the rest of Asia. The days of President Obama’s so-called “Asia pivot” – entailing a renewed and refreshed focus on the continent – are long gone. In October 2015, the U.S. government signed the Trans-Pacific Partnership (TPP) along with 11 other nations, including Singapore, Australia, Malaysia and Japan. The TPP’s goal was to make it easier for the participating countries to trade with each other by removing trade tariffs and lowering importing and exporting costs between members. But Donald Trump said the TPP was “a terrible deal” for the U.S. Then, shortly after winning the U.S. presidential election, Trump announced that one of the first things he will do as president is withdraw from the TPP. Without U.S. involvement, the deal is dead. That means easier access to the giant U.S. consumer market for countries like Singapore will not get any easier. And if Trump starts imposing higher tariffs on goods from Asia, it will slow down trade even further. But soon after Trump promised to withdraw from the TPP, Chinese president Xi Jinping said that “China will not shut the door to the outside world but will open it even wider.” In other words, China is set to fill the void left by the U.S. easing up on globalisation. And it already has deals in place – all of which involve Singapore – that could nearly match the TPP in size. For instance, China is a leading member of the Regional Comprehensive Economic Partnership (RCEP). This is a trade agreement between the 10 ASEAN countries (which includes Singapore) and the six countries with which ASEAN has existing FTAs – this includes China, Australia, Japan and New Zealand. This deal is still being negotiated. If it happens, the RCEP will be a mega trade deal. The 16 countries involved account for more than a quarter of global trade and a quarter of global GDP. Plus, with China, India and Indonesia involved, it would cover almost half of the world’s population. China is also developing the One-Belt, One-Road initiative, which is an effort to create a modern-day Silk Road. The proposed infrastructure will more tightly connect the continent of Asia to Europe and parts of Africa. One estimate suggests that this will end up costing about US$8 trillion. It will allow China to trade more easily with the majority of the world’s population. Singapore hopes to play a key role in this initiative. Not only is it a key part of the Maritime Silk Road portion of the plan, but Singapore also hopes China will use it as a platform to reach out to Southeast Asia and the rest of the world. So even with the potential of less trade with the U.S., Singapore could still benefit from better trade relationships with its Asian neighbours. It used to be that in developed markets (like the U.S., Europe, and Japan), things were comfortable and easy, and there weren’t many surprises. Politics didn’t matter much to share prices. And then there were crazy emerging markets (like most of Latin America, Africa, and much of Asia), the wild west of investing, where anything could happen. Bad politics could erase years of market gains in a matter of moments. When I worked for a political risk consulting company a few years ago, we would talk about how an emerging market was one where politics mattered to markets. That meant that personalities (that is, the people in power) were bigger than, and more important than, the institutions those people headed up. Who’s president, what the parliament is doing, what kind of people are making policy – all of that could be the difference between making or breaking a market. And this is still true in emerging markets, like Brazil and South Africa and Malaysia and Russia. Who the president is and what crazy things he’s doing can completely change the business and investment environment. The big change is that developed markets are looking a lot more like emerging markets when it comes to politics. From Germany to Japan to the U.S., politics in many developed markets are a lot more polarised than they’ve ever been before. Different sides don’t want to talk – they only want to yell. And after a while, a strong personality harnesses one part of this polarisation. That’s what can threaten institutions. And that’s a big risk. This is what we see happening with the popularity of Donald Trump. Even in a developed market like the U.S., personalities are becoming bigger than the institutions they inhabit (like the presidency). If personalities can change those institutions for the better, it’s a good thing. But it’s a big risk – as the history of many countries in emerging markets has shown. This type of uncertainty in the world’s most developed market, the U.S., could translate into more volatile markets everywhere. And that includes Singapore. So with Trump now in the White House, Singaporeans can expect to see more market volatility, less interest from the U.S. and a bump in trade with the rest of Asia. Sometimes the money can just sit there for a long time. I’ve written about “value traps,” which is when a stock or a market is “cheap” (for example, on a P/E or P/B basis) and therefore might appear to be a good value. But that cheap asset can get cheaper… and cheaper still, sometimes as the earning power (that is, the E of the P/E ratio) declines. But other times, there’s a clear roadmap to a cheap asset rising in price. Bear in mind: The same shares of 91 companies are traded on both the A-share and the H-share markets. These are the same shares of the same companies. The only difference is that these two sets of shares are available to different investors. What follows is an example of the China H-shares discount… live and right now. Right now, it’s possible to buy shares of a big resource company on the H-share market (which, as I mentioned, trades on the Hong Kong Exchange), for HK$6/share. I’m going to convert that price into U.S. dollars, just so we have a point of comparison. At HK$7.76/U.S. dollar, that works out to the equivalent of US$0.77/share. So you’d be able to buy shares of this company on the A-share market for about 11.79 Chinese yuan (CNY) per share. The CNY/USD exchange rate is right around CNY6.89/USD. That means that for A-share investors, one share costs the equivalent of US$1.71 (11.79/6.89). Remember, these are the same shares, of the same company. But one share on the H-share market costs the equivalent of US$0.77/share, and the other, on the A-share market, costs the equivalent of US$1.71/share. That’s a difference of 120 percent. And what’s more… the shares of this company are also traded on the New York Stock Exchange (NYSE), as an American Depository Receipt (ADR). That means it’s a foreign company, but you can buy shares of it just like you’d buy shares of any other company listed on the NYSE. Shares of the ADR of this company currently trade at about US$7.69/share. One ADR of this company is made up of 10 local shares (that is, a 10:1 ratio). That means that when you buy one share (as an ADR) in New York, it’s as if you’re buying 10 shares traded in Hong Kong. And that’s the important thing: The ADR is like 10 H-shares (not A-shares). Remember these shares traded on the H-share market cost HK$6/share, which is about US$0.77. And for the ADR, it’s like buying 10 H-shares on the Hong Kong market. US$0.77 times 10 equals US$7.70… which is very close to the ADR share price of US$7.69. What does this mean? When you’re buying the ADR, you’re buying it at the same price level as if you were buying it on the H-share market. 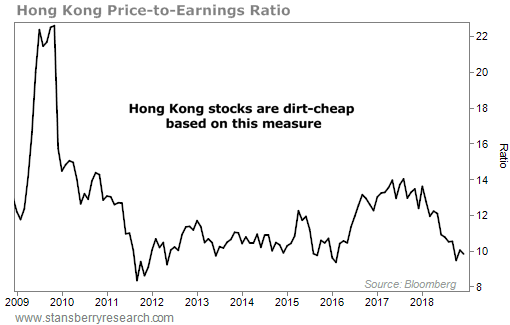 And remember, A-shares are at a 120 percent premium to what other investors are paying for the very same shares on the Hong Kong market, or (for the ADR) in New York. Will the discount between the H-share price (and the ADR price), and the A-share price, close? As recently as November, 2014, the two markets traded at the same price level (although some H-shares still may have traded at a discount or premium to their A-shares counterpart). And there are a lot of good reasons to think that this discount will close again, sooner rather than later – and it will affect some shares differently from others. If this is all confusing, you can learn more by clicking here, (if you don’t want to listen to my voice, click the button beneath the video to read our research). That way you can access the research that I recently completed – as part of a brand-new research service that Truewealth Publishing is launching – that explains all of this in a lot more detail. The example above (for Yanzhou Coal Mining (HK code 1171; NYSE: YZC) is just one example of many. (I used these shares only as an example.) There are other Chinese companies available as H-shares that trade at a discount on the Hong Kong Exchange that’s likely to contract – for a lot of reasons. We show you a few of them in our latest research report, mentioned above. It’s like money sitting in the corner. Now that the TPP is dead, what’s next for Singapore? The Trans-Pacific Partnership (TPP) trade deal was supposed to be a boost for Singapore’s slowing economy. Instead, it’s American electoral roadkill, run over by the rumbling lorry that is the U.S. presidency-in-waiting of Donald Trump. Donald Trump is bad news for global trade, especially in Asia. But while the U.S. is looking like it’s going to pull away, China is taking a greater leadership role in regional economic integration. And there are a number of free trade deals on the Asia-Pacific horizon. As we’ve written before, this part of the world isn’t turning its back on globalisation. Singapore was one of the four initiators of the TPP trade agreement. Singapore, Brunei, Chile and New Zealand came together to negotiate the Trans-Pacific Strategic Economic Partnership in 2006. Two years later, the U.S., Australia and Peru joined negotiations. By February of this year, 12 countries had signed the trade agreement. The TPP was intended to further integrate participating economies. It was designed to reduce tariffs, foster trade and support economic growth. It also included regulations on intellectual property rights, state-owned enterprises, competition and the environment. The 12 countries that were to be part of the TPP make up about 40% of world GDP. These countries also account for 25% of global exports. The agreement could have added 1.1% to each country’s GDP by 2030, as estimated by The World Bank. For Singapore, the TPP participants represent a large market. They accounted for 30% of its total trade in goods in 2013. Thirty percent of foreign direct investment in Singapore also comes from TPP members. Throughout his campaign to become the American president, Donald Trump railed against the deal in his presidential bid. On the campaign trail, he said, “the TPP is a horrible deal… It’s a deal that was designed for China to come in, as they always do, through the back door and totally take advantage of everyone.” (And he may be right, as we wrote here). Trump said he will begin his administration by serving notice of U.S. withdrawal from the trade deal. And no America means no TPP. Trump’s “America first” rhetoric suggests that the country will turn towards isolationism. Large free trade deals involving America are on shaky ground. He campaigned on the promise of bringing jobs back to the U.S. from parts of the world where labour is cheap. On November 6 at a campaign rally in Florida, Donald Trump criticised Singapore, and other Asian countries, for stealing American job opportunities. If Trump’s words turn to action, Singapore should look towards other free trade agreements for an economic boost. With 21 free trade agreements to date, Singapore’s economy has boomed from decades of trade liberalisation. Trade through Singapore accounted for 326% of the country’s GDP in 2015. We recently wrote about the important role trade plays in Singapore’s economy. And as a trans-shipment hub, Singapore relies on international supply and manufacturing integration to help boost its economy. However, renegotiating America’s involvement in the TPP may not directly affect Singaporean exports. Singapore already has free trade agreements with 9 of the 11 other TPP countries, including the U.S. This suggests that China may wind up taking America’s place in future trade agreements. If China takes on a greater leadership role in free trade, the slow and inexorable shift of economic and political power from west, to east, will only accelerate. How would this play out? Let’s look at three deals that could stand in for the TPP. Beginning this December, chief negotiators from 16 Asia-Pacific countries landed in Jakarta, Indonesia for the next round of RCEP negotiations. RCEP negotiations started in November 2012. The deal intends to sync and streamline existing trade deals between ASEAN (Association of South East Asian Nations) and its free trade partners. ASEAN includes Brunei, Cambodia, Indonesia, Malaysia, Myanmar, Singapore, Thailand, the Philippines, Laos and Vietnam. The bloc’s free trade partners are India, China, Japan, South Korea, Australia and New Zealand. Backed by China, the RCEP will be a massive trade deal for ASEAN members and their trade partners. On its own, ASEAN accounts for a sixth of the world’s economy. It also has a favourable demographic dividend, ensuring robust economic growth for some time. Together, RCEP countries share more than one fourth of global trade and a fourth of global GDP. And with China, India and Indonesia participating in RCEP, the trade agreement includes half the world’s population. The U.S. doesn’t have a free trade agreement with ASEAN. And it isn’t included in the RCEP either (although it could – in theory – join the deal later). However, U.S. participation in RCEP is unlikely. The deal doesn’t meet U.S. standards for trade, labour practices and environmental protection. These standards were present in the TPP and some argue they were the reason the TPP was so complex. But the complexity of the TPP is what made the trade agreement so different. The RCEP maintains free trade agreement “status-quo.” It would eliminate, or reduce, tariffs on thousands of goods and services, and cover investment rules, economic cooperation and intellectual property rights. But unlike the TPP, the RCEP fails to address key issues such as state-owned enterprises, the environment and the digital economy. The FTAAP is a trade deal linking Pacific Rim economies from China to Chile, including the U.S. The deal was initiated by the U.S. in 2006. The FTAAP includes 21 APEC (Asia-Pacific Economic Cooperation) member countries, including China. China championed the agreement at a 2014 APEC summit. This move was most likely a response to ongoing TPP negotiations, which excluded China. APEC is a regional economic forum that promotes free trade between Asia-Pacific countries. By including all APEC members, the FTAAP would include major economic players such as Japan, Hong Kong, Singapore, as well as China and the U.S. Numerous regional and bilateral free trade agreements already exist between APEC members. The FTAAP aims to harmonise the group’s “spaghetti bowl” or “noodle bowl” of free trade agreements. The FTAAP could be one of the biggest free trade deals in history. First, it would encompass the world’s two largest economies, the U.S. and China. Second, it would include the world’s “factory” in China and Southeast Asia. Third, it would represent the world’s biggest consumer economy. And finally, FTAAP countries collectively possess a vast base of natural resources. According to a 2014 study, the FTAAP could result in income gains for member nations of nearly $2 trillion dollars by 2025 – representing almost 2% of world GDP in 2025. The FTAAP is much larger than the TPP. President-elect Trump didn’t like the TPP. And the people who voted him into office weren’t fans of it either. So, it seems safe to assume that the FTAAP won’t be popular in America at this time. Without U.S. participation, global gains from the FTAAP will be delayed for some years. Even if the TPP dies, free trade will carry on. With Trump in power, the U.S. may enter into more bilateral trade agreements (involving only two countries), rather than multilateral trade agreements (involving more than two). Through new agreements, Trump hopes to “repatriate” manufacturing jobs to the U.S. He wants to implement policies and negotiate trade deals that encourage manufacturing companies to provide jobs to Americans rather than employing low-cost labour abroad. If Trump implements his policies, Americans will actually lose the most. Globalisation of production brought American consumers very low prices. These will rise once production returns to American soil. Although low energy prices from Trump’s policies may offset some of the costs. Countries like Singapore can expect Trump to either negotiate a new trade deal or a series of trade deals with Asian countries. China may even be included in trade agreements. But in the meantime, Singapore, along with the rest of Asia stands to lose. But that doesn’t mean there aren’t fantastic investment opportunities in Asia at the moment. There are three Chinese companies in particular that are poised for tremendous growth. You can learn all about them – and the best way to invest in the Chinese market – by clicking here. Jim is an investing legend, best-selling author and Guinness World Record holder – and one of the most well-traveled people you’ll ever meet. He’s visited most countries on earth – many while traveling around the world on a motorcycle and by car (forming the basis of two of his books, Investment Biker and Adventure Capitalist). In addition to his great investing insights (see here for more of them), Jim is an authority on where to travel… and how to follow your passions. I recently sat down with Jim (who is a fellow Singapore resident) for a chat… below are excerpts of our conversation. During his travels, Jim has been to lots of places that most people have never even heard of. So I asked him what parts of the world were so captivating and compelling that he’d like to go back. Me: [Regarding your travels], what are places that… you would go back to visit, [places] that really captured you during your travels? Jim Rogers: Well, that’s a good question. I usually think in terms of countries I haven’t visited, that I would like to visit. Chad, I haven’t been to Chad [in northern Central Africa, just south of Libya] for some reason, so it pops into my mind. China is always fascinating to go, but I go to China a fair amount. Russia, I was very pessimistic about Russia. Didn’t even like to go there, but now I like it. It’s changed, or maybe I’ve changed. Something’s changed so I do like to go to Moscow now, very much so. Taj Mahal, that’s another thing. They shouldn’t let people take pictures of the Taj Mahal because you go there and you think, “Well I know what the Taj Mahal is,” but when you see it in person, it’s entirely different, still bowls me over when I walk in there and see it in person. Likewise, the terracotta warriors out in the Chinese desert in Xi’an. They knock me over every time I see them. And, again, you’ve seen the pictures. You think you know what you’re going to see. The pictures do no justice to it. Me: If you were speaking with a young person who is just finishing, let’s say, high school, who said, “Mr. Rogers, I want to have an exciting life and make money.”… what would you say to him or her? Jim Rogers: Well, the most important thing for everybody is to only get involved with what you, yourself, know a lot about, or… figure out your own passions and pursue your passions. Don’t listen to me. Don’t listen to your teachers. Don’t listen to your parents. Don’t listen to your friends – especially your friends. They all want to do whatever is popular and hot at the moment, your parents too, and your teachers too, probably. … Those are the people who are most successful, and of course they are the happiest people. And if they’re not successful they don’t care, because they’re happy. They don’t care if they’re successful or not, they are so happy having so much fun. … I mean, Kim, if you want to be a gardener, you should be a gardener. Now, your parents are going to say “What is going on here? We didn’t spend all this money raising you and educating you to be a gardener,” and your teachers are going to say, “Why are you even here? Why don’t you leave and go be a gardener? What a waste.” Your friends… they’re going to laugh and giggle. … that’s how you become successful and happy. Jim had a lot more to say during our extended interview… including where he’s investing right now, and the biggest mistake he’s ever made. For immediate access, click here. As we’ve noted several times over the past few months, China’s middle class is set to become the largest in the world. Its spending habits are set to change the world of consumerism. And the middle class is also setting off a boom in China’s insurance sector. A recent survey of 2,000 middle to upper-income Chinese by Ernst & Young revealed that 80 percent view China’s serious pollution problem as a major health worry. People in China are also anxious about the costs of getting sick – 93 percent of respondents with insurance coverage said their coverage was less than satisfactory. They viewed the Chinese government’s basic health insurance plan as minimal at best. The fear of financial disaster from a devastating illness haunts the daily lives of many people in China. China’s middle class is predicted to hit 550 million people within the next five years. And the biggest growth will be in the “upper middle class,” which earns substantially more than the “mass middle class,” according to consultants McKinsey & Company. And what will increasingly wealthy consumers who are worried about their health – and the cost of health care – do? One thing they’ll do is get health insurance. China’s public healthcare system currently covers 97 percent of the country’s population. But like healthcare systems in many countries, it’s inadequate. Costs are rising fast. There are large differences among plans, and many patients are forced to pay much of their medical bills out-of-pocket. Meanwhile, government hospital subsidies are insufficient. This effectively forces hospitals to pass on costs to patients any way they can: Expensive drugs, over-prescribing medications, under-the-table arrangements, and other inefficient and dangerous measures. To make matters worse, China’s population is getting a lot older, fast, which means higher medical costs. Right now, roughly 16 percent of China’s population is over age 60. By 2050, 25 percent will be age 65 and older. And 50 percent will be 45 and older. This will only put more pressure on the country’s flailing health insurance system. A growing middle class, a struggling public health care system and an aging population are music to the ears of private health insurance providers in China. Partly thanks to strong growth in health insurance, premiums written by China’s life insurance industry overall grew by 48 percent year-on-year during the first seven months of 2016, as shown in the graph below. Besides rapid growth in premiums collected by insurance companies – which they use to pay the bills, pay out claims and invest to earn income – the potential for rising interest rates will boost insurance company profits. Here’s how it works: When insurance companies receive premiums, it’s cash in hand. Much of the value created by an insurance company depends on how much of a return they can generate from that cash. Insurance companies tend to invest the premiums they receive very conservatively – typically in fixed income securities. Just as individual investors have suffered reduced interest income from low interest rates, insurance companies’ bond portfolios have suffered. When interest rates are higher, insurance companies make more money; and when they’re lower they make less. However, coincident with the election of Donald Trump as U.S. president, global bond yields have been rising. Global bond prices had a catastrophically bad month, falling about 5 percent through the end of November (bond prices move inversely to interest rates, so interest rates have gone up). The yield for China’s 10-year bonds now hovers at a five-month high of 2.9 per cent. If bond yields continue to head higher, watch for Chinese insurance companies profits to take off. As a long-term investment theme, I think it’s hard to argue with the insurance sector in China. In a just-released presentation we talk about one insurance company in particular that’s set to do particularly well… the share price of which has only just begun to take off. It’s part of a bigger research project that’s kept me and my team busy for months. You can find our more about it by clicking here.